This dinner set is an example of our functional line of pottery that includes: tea pots, mugs, casseroles, steamers, bakers, trays, butter dishes, garlic keepers, vases, and urns. 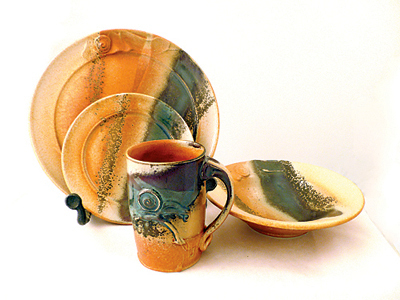 This dinner set is decorated with a combination of glazes called Kootenay blend. 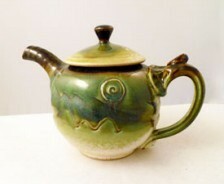 This teapot is decorated with a combination of glazes called Valhalla Ice. 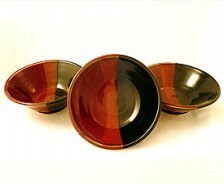 These bowls are decorated with a combination of glazes called Tequila Sunrise. Monday thru Sunday from 9:00 to 5:00 during the summer. Fall to Spring we are open Monday thru Saturday.